Six of my close friends are pregnant at this very moment, and I know at least four other women having children this year. Add in the friends that already have children, and let me tell you - I hear a lot about pregnancy and babies. To be clear, I am not pregnant. However, pregnancy and childbirth are important milestones in many women's lives. And honestly, when my friends talk to me about this stuff, I would like to have something to contribute to the conversation. And if that contribution is, "Actually, studies have shown that you can eat sushi and drink wine, so let's go somewhere fun for dinner tonight. SCIENCE!" then that is all the better for me. 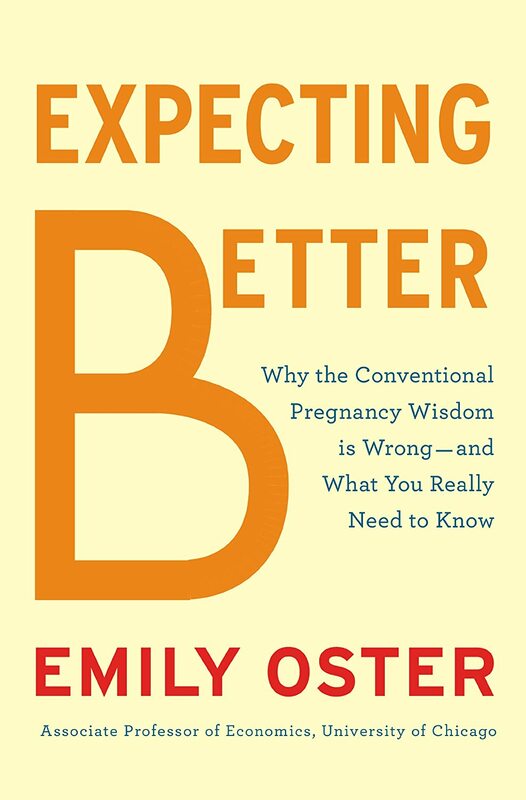 Emily Oster's book Expecting Better is about all of the rules and advice and myths that surround pregnancy, and whether they are justified or not. Oster is an economist, and when her doctor told her things like, "Don't drink coffee," she asked why. And then she went and researched the studies that were cited as evidence so that she could make her decision about coffee for herself. Oster emphasizes several times that she isn't trying to prove a rule right or wrong; she's trying to provide information to people so that they can make decisions for themselves instead of feeling scared or overwhelmed or guilty all the time. As she says, information is power, and you can decide what to do with the information. I thought the early chapters of this book were more applicable to me as a woman than the later chapters. The later chapters were definitely focused on the birth stages, how to initiate labor, how to make a birth plan, deciding on whether to use an epidural or not, etc. Definitely not anything that I need to know right now, though I found the information interesting and have already spouted off some facts about epidurals to a couple of friends. The earlier chapters talk about getting pregnant, the early stages of pregnancy, and women's bodies. There was a lot of really good information about genetic testing and a ton of information on drinking coffee and alcohol, eating sushi, managing your weight (LOTS on weight) and taking medication. I think Oster's approach to pregnancy is one that more people should adopt. I like how she thought critically about everything and didn't just take anything at face value. She cited every study she looked at and said very clearly why she believed it to be valid or flawed. She then talked readers through how she viewed the information and came to her decision, and would often give a little note about what her other pregnant friends decided after seeing the same information (often, they all made different choices, though they had the same information). I can't imagine Oster was her gynecologist's favorite patient (and it did seem in the book as though Oster had a very tense relationship with her doctor), but I do think Oster is a great advocate for other women. She points out that the studies are all publicly available, which is great, though I wonder if non-economists or scientists would be able to sift through which are good and which are bad. Oster talks about sample size (which makes sense) and the null hypothesis (which I understand, but probably would not think about when reading a pregnancy study), and many other important facts that I probably would not catch because I have never done a research project before. So, for all of us who are not PhD's, I'm glad this book exists and that Oster took the time to write it instead of just hoarding all of this important information to herself. I read this as an audiobook, and I enjoyed the narration, though the audiobook probably could have been edited a bit. There were a few lists of medications and symptoms and illnesses and how to treat them that I do not think were necessary in the audiobook. Therefore, if you're pregnant and interested in this book, I recommend the physical copy - it seems to have a pretty handy appendix, and I think it would be a good reference guide for a lot of questions you might have as you go through your pregnancy. For those who are not pregnant - the audiobook is great, and I recommend it. >>>I wonder if non-economists or scientists would be able to sift through which are good and which are bad. Hahaha, I wonder if EVEN economists or scientists would be able to sift through which are good and which are bad. I read an article a while ago about how essentially terrible most study-doers are at sifting through data correctly, and how many mistakes are made, and also how much people juggle the data to get the results they want. It made me hugely suspicious. That is terrifying. But completely believable. I bet people at my office do that all the time to get the results they want. I enjoyed reading your thoughts on this one. An interesting companion volume might be The M Word, edited by Kerry Clare, though it's a recent Canadian collection of essays, so I'm not sure how widely available it will be to you. Nonetheless, the variety of experiences and the feminist perspective make it a worthwhile addition to the bookshelf for sure. Thanks for the tip! I admit I probably am not going to read more maternity books for some time, but I'll pass the suggestion along to my friends! This does sound interesting. Although, I do think birth plans are not worth much, as so much is out of your control once labour starts. I think it's fine to have an idea of what you want, but not to get fixated on thinking things have to go that way. I really wanted a water birth, but I found that being in the water didn't help my pain at all when my contractions actually started. I wish this book had been around 10 years ago! It sounds interesting enough that I might still pick it up even though I'm definitely done with the baby thing. Fab post -- I esp loved "And if that contribution is, "Actually, studies have shown that you can eat sushi and drink wine, so let's go somewhere fun for dinner tonight. SCIENCE!" then that is all the better for me." My wife will cheerlead for me, happily, when I'm surrounded by the pregnancy police. Yes, it's difficult to strike a balance between sanctimonious and brutally honest in pregnancy, it seems - people seem to take such hard stances one way or the other! Though I don't think Oster does that too much, which I appreciated. I think your method makes sense - if it works for you, who cares? :-) Hope the pregnancy is going smoothly and that your wife is armed with all the knowledge you two need! I love how you wrote "To be clear, I am not pregnant". Ha! I have a love/hate relationship with books about pregnancy. Some talk endlessly about things that don't matter while others are BORING. Why is that? This sounds really interesting so I may read this one one day.